« DressLily Is Having A GREAT Sale Right Now! You Can Get Up To 70% OFF Prices As Low As $6.20! Looking for a new cupcake recipe to try? Well if you are like me and love maraschino cherries, then you will love this maraschino cherry cupcake recipe. This takes the best part of a dessert, the maraschino cherry and turns into the dessert it’s self! 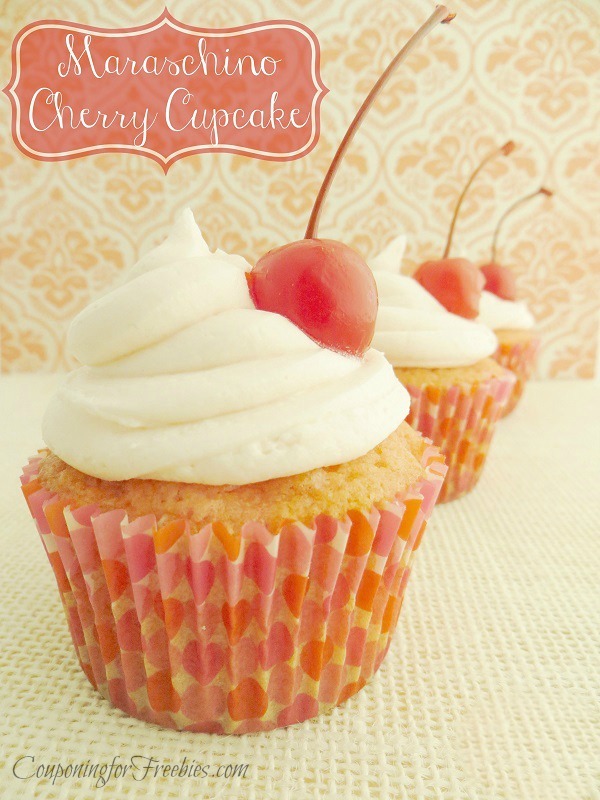 This recipe if for maraschino cherry cupcakes with maraschino cherry frosting!! These are so YUMMY!!! If you need some cupcake liners, Amazon has some super cute ones. Heat oven to 350 degrees F. Line regular-size muffin cups with paper baking cups; set aside. Finely chop cherries and place in paper-towel-lined bowl to drain while preparing batter. In a medium bowl, stir together flour, baking powder and salt, set aside. In large bowl, beat butter and sugar with electric mixer on medium speed until well blended. In a small bowl, stir together ½ cup cherry liquid, the milk and 2 teaspoons almond extract. Beginning and ending with flour mixture, alternately add flour mixture and cherry mixture to butter mixture, beating well after each addition. If desired, stir in a few drops of food coloring until desired pink color is achieved. Fold in stiffly beaten egg whites. Fold in chopped cherries. Spoon batter into muffin cups, filling each about ¾ full. Bake 20 to 25 minutes or until cupcakes spring back when lightly touched in center. Remove from muffin cups to cooling rack. Cool completely, about 30 minutes. To make frosting, combine butter, sugar and salt in a bowl. Beat until blended. Add the milk, vanilla and cherry liquid and beat for an additional 3 to 5 minutes or until smooth and creamy. Pipe frosting onto cupcakes and garnish each with 1 cherry with stem.